When I finished Sojourn this evening I gently laid the book down and gazed ahead, the myriad story elements floating about my head like a cloud, and my first though was "Crap, I wonder if I still know how to write a review." It's been a little over a month now since the last time I wrote a review. Whatever my excuses I'll have to brush up fast because this post marks the final installation in the much celebrated Dark Elf Trilogy by R.A. Salvatore and my final post for the year. For anyone who missed the first post on Sojourn you can find it here: Internal Conflict or Bust. If you'll recall I brought up a gripe last time about how our hero, Drizzt the dark elf, skilled swordsman, exile of his own race, somehow seemed immune to the daily trials and tribulations of survival. Well when I picked up where I had left off (I wasn't reading during that month long hiatus) the book saw fit to throw all that back in my face and then kick me for good measure. For the first time in three books Drizzt struggled. He was described hunting for fish in the cold autumn days leading into the winter. He struggled to make a fire and keep warm as winter fell, the season phenomenon unfamiliar to one who had lived underground his whole life. In reference to his time alone in Exile Drizzt recalled working in the kitchens as a young boy and burning dried mushroom stalks during his self-imposed exile. Well about damn time. If a bit late in the story, Drizzt pulled together previously undisclosed pieces of his past retro-actively shedding light on his survival up to this point and revealing a stint of illicit drug use. (He was burning giant mushrooms, how else should I interpret that?) Although I'm still skeptical that Drizzt lit fires in the tunnels during Exile without running into smoke issues, and I am still curious as to what he was eating during the early half of Sojourn, the details of Drizzt's first winter did much to alleviate my previous gripes. Teach me to open my big mouth. On a whole Sojourn did a good job of wrapping up a three book story that, quite literally, covered a lot of distance. However, until the latter half, I was largely unimpressed with the settings and new characters. Sojourn starts slow, but uses the opportunity to build important plot points that proved salient throughout the entire story, even into the satisfying finale. And along the way R.A. Salvatore also seemed to be trying to hurriedly check off as many generic fantasy clichés as possible. As soon as Drizzt departs the first village you can hear the scrape of metal as Salvatore crowbars in all the fantasy heavy-hitters. Don't get me wrong here, the characters are decent and they all have points that really make them shine, but that doesn't stop them from winding up on a bullet list. With Drizzt in hand you can check off legendary swordsman right off the bat, which can be followed up by noble ranger, grizzled barbarian, impeccable Elven archer and other-worldly evil before earning combo points with a blind badass/learned master in one. Throw in a dragon, some dwarves, and a wizard somewhere in there and you have your very own fantasy starter kit. I will say that I am glad that the antagonists (aka. the other-worldy evil) I mentioned last time actually occupied a relatively small portion of Sojourn. Much like Voldemort's character I wasn't too impressed with the early villains because they were far too predictable. Thankfully their active role in the story wasn't overly long and served to initiate a larger conflict that propelled much of the later story. In the same vein as the early antagonists you also follow a band of adventurers who begin tracking Drizzt. Again, they too play an important role in the storyline, but in the latter half the band is conspicuously absent. I only mention this because there is a lot of set-up for these characters even though they never again make a prominent appearance in the latter half of the book. Many of the band of adventurers seem to have the hallmarks of a returning character, so I have to wonder if they make appearances in later books. Only one character from the group tracking Drizzt manages to make his way into the last half. Roddy McGristle, the previously unnamed 'grizzled barbarian' performs as an excellent if single-minded antagonist who spends much of his time lurking in the background of Drizzt's story. He's a simple villain, but in a good way. He is single-minded and obsessive, which makes him somewhat unpredictable because he will stop at nothing to catch up to Drizzt. That sort of unrelenting fixation is scary enough in itself if you've ever experienced it in person. As a result Roddy ends up serving as the catalyst for much of Drizzt's later conflicts, from the tracking party that initially chases Drizzt, to the final intense confrontation years later and hundreds of miles away. And in the middle of it all, where the story really starts to turn from boring to intriguing, is when Drizzt meets Montolio, a retired ranger who teaches Drizzt everything he needs to become a ranger himself. He's pretty much Drizzt's version of Master Yoda from Star Wars. Which brings me to my next point. For all the Dark Elf Trilogy's ups and downs, one thing I've noticed about R.A. Salvatore's style of the writing is how much it parallels Star Wars at times. Not the story, no no, but the presentation. Sojourn, being part of the Forgotten Realms franchise was probably intended for a general audience much like the Star Wars franchise. So people die and horrible things happen, but often in a very 'nice' way. There is often little blood and if something truly gruesome happens, say, someone is torn in half for a hypothetical, the story is unlikely to elaborate much beyond 'they are in two pieces'. There is also a tendency, and this isn't necessarily a bad thing, for the fantasy to lack a sense of realism. This is a point I'm not particularly opinionated on. Normally I just roll with whatever the context of the world is, so as long as there is consistency I can enjoy it. Much like Star Wars however, there is a certain something that keeps me from being fully invested in Sojourn. Much like unwittingly eating something 'sugar free', something is weird, but I can't quite place it. R.A. Salvatore's characters also share some similarities to character presentation in Star Wars in that you don't really have to worry about characters dying unless they are up against a long running villain. Bad things can and do happen to prominent characters but rarely without encountering a prominent villain. Character-McBadass isn't going to die in his bed because Orcs snuck in during the night. So when I reached a part where a raid was staged against Montolio's grove, even though Drizzt and Montolio were vastly outnumbered, I had the outcome pinned down to one of two situations. The raid did make for a good bit of action, but since I wasn't convinced of the danger I wasn't immersed in the action. I also found the battle scene rather chaotic since it mentioned a lot of terrain details and traps that there really just wasn't enough time give proper context to. By comparison, in the final book of Harry Potter, despite the intensely chaotic nature of the fight at the end of the book, it was relatively easy to envision the details because you had spent several books constructing a mental map of Hogwarts and the surrounding area. Despite this indiscretion R.A. Salvatore more than made up for that fight with an excellent duel at the end of Sojourn that was intense, fantastically easy to visualize, and unpredictable. Where Sojourn really shines, however, was not in the (mostly) well constructed fight scenes, nor the interesting twists and turns in the plot, but in the character dialogue. R.A. Salvatore's world building sometimes leaves me feeling slightly disconnected from the world, and the fact that the Forgotten Realms world is based on a Dungeons and Dragons game world is probably to blame. But what pulls me back in and keeps me coming back for more is the real, raw character dialogue. Nothing in all the Dark Elf Trilogy seems more honest and immersive than the private conversations of some of the characters. The dialogue is definitely worth praise because there are moments here and there that are just so true to life, so human that even when they are spoken by an elf or dwarf you can believe for a moment that it's actually happening. There was an excellent scene between Montolio and Drizzt in which he, in a sense, forces Drizzt to open up while sitting underneath a starry sky. In that manner I could just as easily see two friends sitting on a porch, or laying by a river, in real life. Only I sincerely hope that your friend in that situation wouldn't be confessing to having fought the reanimated corpse of a loved one. So, maybe some slight differences *cough*. There was another great line from a dwarf towards the end of the story. I don't want to spoil who he is but the line from him as he is speaking to Drizzt was, for me, such a believable thing to read. You need the context to truly appreciate it, but it was a very memorable line for me. 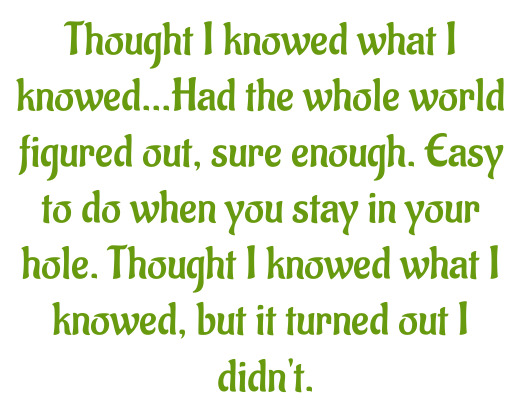 "Thought I knowed what I knowed[...]Had the whole world figured out, sure enough. Easy to do when you stay in your hole. [Thought I knowed what I knowed, but it turned out I don't.]" Well, last impressions are that Sojourn and the Dark Elf Trilogy are worth a read. It was kind of a bumpy ride with a slow beginning and a lukewarm middle, but by the time you reach the last third it almost seems a different book. For anyone who really enjoys fantasy you should at least give the trilogy a chance. There's plenty more of R.A. Salvatore to be had in the future, as I've barely scratched the surface of my wife's collection, but for a time I think I will be taking a break with another author. Expect to hear about The Briar King next time. As for some final notes, I've been wanting to work on my humour a little more but any that found its way in today was rather spur of the moment and unpolished due to my time constraints. I really wanted to get this post in before 2015 so I that I had officially finished 8 books before the end of the year. Woo! Speaking of which, Happy New Year everyone! I hope you all have a great 2015 and I hope you've enjoyed/are enjoying my progress on No Book Unread. I look forward to a productive new year and (hopefully) big improvements in my writing. So this has been running through my head for a while. While this isn't my usual fare I began to think to myself; since this series started in the 1980's what 80's songs match the themes of the books? Hence, I present you my selections for each book in the Dark Elf Trilogy. Every time I see these books at the bookstore, I have this irresistible urge to pick them up. But the fact that high fantasy is not really a genre I tend to read somehow stops me from acquiring more books that will collect dust on my shelves. Don't get me wrong, Salvatore sounds like a brilliant writer, but I'm a simple-minded girl, with an imagination that is somewhat limited to the world that I know. So yeah. I am in awe of readers like you. For someone who hasn't reviewed a book in a while, you seem to have found your strides quite easily. Damn. If you ever have the opportunity you should give RA Salvatore a shot (if the mood hits you). My wife loves his books, particularly his character. I'm sure you have a very busy review schedule, not to mention your own backlog of books to go through but it's always good to explore the edges of your tastes from time to time. As for my post, well, I guess I just had a lot of pent up energy (and notes) after finishing the trilogy, haha! These are the ones that I visit regularly and whose reviews continue to amaze me. Check them out if you're looking for well-written reviews and well-read people. 746 Books was right up my alley and the reviews are great. Thanks for recommending that one! I thought I had it bad with somewhere in the area of 200 books. Cathy apparently had an entire library hiding in her house. Somehow it makes me happy to see someone else working on a similar project. I wasn't kidding, honest! I guess I just had a lot more to say then I expected. Thanks for the compliments on my review by the way, I've been putting a lot of effort into trying to improve my writing. As far as the genre goes I haven't found a particular niche that really calls out to me, and high fantasy certainly doesn't hit all the right spots for me either. (Though I still enjoy it.) What exactly is 'grimdark' stuff though? Is it dark and gritty fantasy worlds? If so I might be reading one right now. It also kind of reminds me of K.J Parker's Engineer's trilogy, a series I read quite a while back.